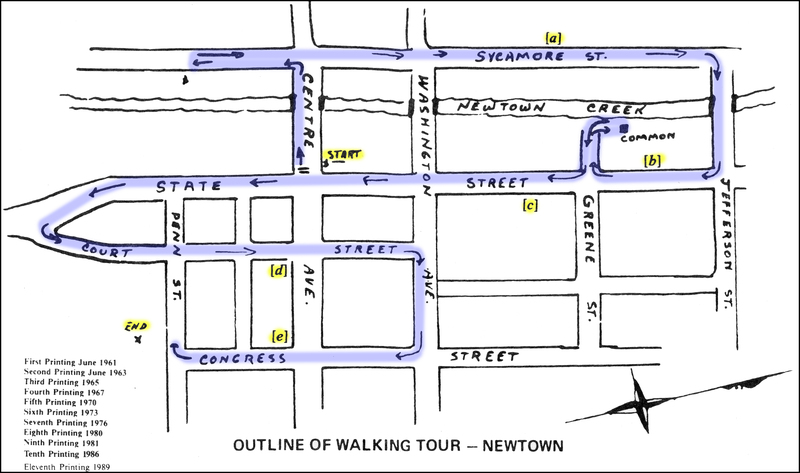 This walking tour was first published in 1961, by Dr. Raymond V. Hennessy. The following text and map were taken from the 11th printing of 1989 and the printed brochure is still available at the NHA headquarters in the Half-Moon Inn. Though there have been some changes in Newtown since then, much of the below remains of interest and applicable today. The 5,000 acres originally comprising Newtown Township and the Townstead were part of the vast tract purchased by William Penn from the Indians by William Markham, Penn’s agent, on July I5, 1682. The plan of the township and townstead were surveyed by Thomas Holme in 1684. Its boundaries appear on his map of that date essentially the same as they are today. It was called New Township which later was shortened to Newtown. The town through the centuries has experienced most of the events and changes both good and bad that have occurred in the growth of our nation. Nevertheless, it has managed to retain a feeling and look of intangibles left by forgotten people who have put their mark upon it. There are many things in Newtown of interest to the antiquarian besides what is covered in this walking tour. However, it is hoped that this tour will bring to your attention the historical heritage so rich in this little town in Bucks County. Though the walking tour may be started anywhere along the route as outlined on the map, we suggest starting at the Northwest corner of State Street and Centre Avenue at the clock of the First National Bank and Trust Company. Founded by Barclay J. Smith. Began operation March 5, 1864. Moved to present location in a brown stone building in 1884. The present yellow brick building was built in 1928 and new additions were added in 1958 and 1986. Just behind the First National Bank Trust Department Building was the site of the Newtown Academy built in 1798. This first school of its kind in Bucks County was subsequently conducted under the supervision of The Presbyterian Church. Discontinued in 1886, later occupied by The New Century Club of Newtown. Razed in 1957. Proceed west on Centre Avenue to Sycamore, crossing Newtown Creek, then South on Sycamore to the Milnor House. In the early 19th Century, Centre Avenue was called Bridge Street because this was the only bridge at that time crossing the creek. In Colonial days it was called King Street. Notice the date stones on the bridge. Sycamore Street then was known as the Other Street. Built in 1800 by John Milnor, a stone mason, on lots #30 & #31 of the Commons. Milnor operated a quarry here and quarried the stone for his own house and others in Newtown. Restored in 1954. Interesting herb garden on South side of house. North on Sycamore Street to site of Washington’s headquarters. Along Sycamore Street may be seen several old stone houses dating from the late 18th and 19th centuries. Most of the ground West of the street comprised two grants by William Penn, one to Thomas Rowland, dated December 12, 1684, and the other to William Buckman, dated 1695. Between Centre and Washington Avenue on the East side of Sycamore Street there existed on the Common one of the three tanyards that flourished in Newtown before the Revolution. Excavations in 1870 uncovered the old wooden vats. Original house built in 1757. Torn down in 1863, but rebuilt soon afterwards on the old foundations of similar lines, and out of stone of the original headquarters house. Washington had his headquarters here before and after the Battle of Trenton on Dec. 26, 1776. In this house he wrote his two famous letters to Congress giving the official report of his victory at Trenton. The house at that time was owned by a widow, Mrs. Hannah Harris. The rebuilt house was demolished in 1964. Built in the early 1800s on Lot 47 of the Common. It flourished as an inn for many years. It was here in April, 1864 that Roman Catholic services were held for the first time in Newtown. Now a Restaurant. Continue along Jefferson St. to State St. — South on State St.
State Street was originally called Main Street and is a continuation of the old Durham Road to Bristol, one of the first roads in the County. As you continue South on State Street, you will notice many interesting old brown stone houses dating from late 1700s and early 1800s. DOLOHAN HOUSE — 149 N. State St. Built in 1793 by Daniel Dolohan. Purchased by Thomas G. Kennedy, Esquire, a prominent citizen of Newtown about 1810. He married Eliza Hicks, daughter of Isaac Hicks and sister of Edward Hicks. She was drowned in Newtown Creek July 28, 1817, attempting to save her son Augustine, who was subsequently rescued. This is the first recorded drowning in Newtown Creek. This house was later occupied by Joseph O. Archambault when he first moved to Newtown about 1820. Note interesting keystones over windows. House built by Betsy Kennedy, sister of Thomas G. Kennedy, in the early 1800 s. Note interesting ornamental iron work on porch added about the time of the Civil War. It is cast iron made by the York Foundry Co., York, Pa. This foundry made a great deal of the ornamental grill work so famous in New Orleans. West side of State St., below Jefferson St. Established in 1857 by J. V. & W. Randall. Important industry of that period. Two sales were conducted each year. It is related that during the sales State Street from Jefferson to Greene would be lined with buggies and wagons for sale. Restored 1964. BUCKMAN HOUSE — 119 N. State St.
Fine example of Victorian architecture. Built in 1839. For several years home of Kinsey B. Tomlinson, former storekeeper and first president of the First National Bank and Trust Company. Later purchased by Lewis Buckman. Note gazebo in garden, beautiful holly trees and stone pillars at entrance to driveway. NEWTOWN COMMON Turn right on Greene St. When Newtown was surveyed in 1683, 30 acres on both sides of a “pleasant stream,” Newtown Creek, were reserved for free use of water and pasture land for all the inhabitants-.This particular plot is part of Lot #16 and remains as public Property. Notice the brownstone marker. COUNCIL ROCK YOUTH & COMMUNITY CENTER INC. Honor Roll to Newtown Veterans of all wars. Erected by Morell Smith Post #440. Dedicated Memorial Day, 1964. BRICK HOTEL — Northeast comer of State St. & Washington Ave. In 1764 Amos Strickland built a two-story brick building as his mansion house, which was converted to a hotel in 1828 by Joseph Archambault. He added the two-story brick addition to the west end. He employed Edward Hicks to paint a tavern sign for the inn. Northwest corner of State and Washington Ave. Organized as Newtown Title and Trust Company. Cornerstone laid September 13, 1928. Opened November 1928. Merged with the Central Penn National Bank of Philadelphia April 25, 1958. Now Meridian Bank. Southeast corner of Washington & State Sts. Built by Robert Smock in 1790. Used as a home and office building for many years. Original part of present inn built about 1772 by Andrew and Nancy McMinn. One section of the building was used for a tavern and another section for a school that Andrew McMinn taught. In 1865 Joseph Willard became the proprietorand named the hotel “The Niagara Temperance House” after a double-faced oval sign painted by Edward Hicks depicted a large moose standing by Niagara Falls. The Niagara was soon dropped and the inn became known as the Temperance House, the name it bears today. Conveyed to Mr. and Mrs. George Benetz in 1934 who operated the inn until 1965. EMAN SCOTT HOUSE — 17-19 South State St.
Erected by Eman Scott, saddler, sometime before 1792. As early as 1800 part of the building was in use as a bakery shop, run by one Tamar Worstall, famous for her pies and ginger cakes, selling them on all public occasions. JAMES RAGUET HOUSE — 21 S. State St. Built sometime before 1784. Site of general store of James Raguet, prominent merchant. In 1816 the post office was located in his store. In 1904 purchased by L. C. Wettling who opened a jewelry store on the premises. Purchased in 1922 by C. H. Bunting. Entrance hall and stairway have beenretained in their original condition. Built in 1796 to house the county offices, the court house buildings being across the street. It houses the First National Bank Trust Department. Present building is situated on the exact location of the gaol that was part of the court house buildings. Built in 1726. Parts of the stone wall still standing were the original walls enclosing the cells. Built in 1747. Purchased in 1754 by Margaret Thornton, owner of the “Court Inn.” Purchased in 1772 by Francis Murray, prominent citizen and soldier in the Revolution. He and his family operated a general store here. Now a restaurant. House built of native brown stone in 1828 by Dr. Phineas Jenks, prominent Newtown physician. At one time it was one of the outstanding mansions of the town. Dr. Jenks was one of the founders of the Bucks County Medical Society, and the Newtown Episcopal Church. Built in 1795 by John Torbert, saddler. Occupied for many years by Job Hollinshead, clock and watch maker, who conducted his business at this site. Built in 1768 by Anthony Siddons for use as a tavern. After Anthony’s death his widow ran the inn and it was here that William Alexander, Lord Sterling, had his headquarters and recuperated after the Battle of Trenton. Continued as an inn until 1800 when it became a private residence. Original home of Shadrach Walley, erected prior to 1690. His son, John, conveyed it to George Welch who obtained a license June 16, 1726 to retail “rum and strong liquors by either the gill or small measure.” The building thus continued as a public inn for some 150 years. After the Revolutionary War it was called “The Old Frame House.” In February 1778 the British raided the tavern killing five Continental soldiers and capturing several others. Several Tories lost their lives in the skirmish. About 1820 Edward Hicks painted a sign for Tamor Cary, then owner, picturing Franklin’s adage “A Bird in hand is worth two in the bush.” Since then it has been known as “The Bird in Hand.” The Newtown Post Office was established here in 1800. In 1819 the Newtown Reliance Company for the Detection and Apprehension of Horse Thieves and Other Villains was organized here. Restored by Edward R. Barnsley in 1937. Built in 1810, by Thomas Ross as a hotel. For many years was a meeting place of the Independent Order of Odd Fellows. Stands on a lot that Squire Isaac Hicks purchased in 1796. He lived there in a frame house until his death in 1836. Occupied by Quartermaster Department during Revolutionary War. During this period the Doan Brothers raided the place, shot the watchman, and carried off some of the supplies. Received its first license as a tavern in 1852. Original old section dates to 1719. Was residence of John Hart, County Treasurer. In this house in October, 1781, the Doan Brothers, Bucks County outlaws, held up Hart, took his keys and robbed the County treasury of Newtown of $2300. FLAT IRON — Name given to point of land at junction of Court Street and State Street. Pointed geometrical appearance resembles shape of an old flat iron. Listed on the National Register of Historic Places Built in 1817 by Newtown Preparative Meeting of Friends. In the grave yard is buried Edward Hicks, 1780-1849, famous American primitive painter. Old section of Court Street begins as you cross Penn Street. This section of Court Street, from Penn Street to Centre Avenue, is unquestionably one of the most picturesque streets in Bucks County. The houses were built in the 18th and 19th centuries and are all occupied by Newtown people who choose to live in this quaint atmosphere. Typical small Newtown 18th century native brownstone house. Built in 1774 by Joseph Worstall. Site of a tannery and boot and leather shop for many years. It is related that General George Washington, when headquartered in Newtown, purchased a pair of boots from this shop. The stone section of the house north of the Worstall House, 121 Court Street, was built by Joseph Worstall for his daughter Mary. Built in 1837 by Joseph Schofield, carriage maker. Notice Philadelphia gas light. Built about 1757 by Margaret Thornton who operated the Court Inn after her husband’s death. Brick front added 1764. Made of bricks left over after the construction of the Brick Hotel. Abraham Chapman was the next owner who sold it to Edward Hicks in 1811. Hicks lived there for ten years. Headquarters of Newtown Historic Association, Inc. Famous Tavern built in 1733 by Joseph Thornton, Sr. Originally called the Half Moon Inn, now known as the Court Inn because it is located diagonally across the street from the former site of the Court House Building. Listed on the National Register of Historic Places. Built in 1770 by Barnard Taylor. Sold in 1784 to Francis Murray, prominent citizen and soldier. During Revolutionary War he commanded the first company of volunteers from Newtown. Built in 1882 by Newtown Library Company on ground donated by Jesse Leedom. Housed the library of 2,000 volumes until 1911. Addition in front constructed in 1911 by Wm. R. Stuckert. Notice original Newtown gas lamp post. In the area bounded by Court Street, Centre Avenue and State Street and an alley 160′ to the North stood the court house buildings. Newtown being the county seat from 1726 to 1813. The buildings consisted of Court House, Treasury Building (raided by the Doan Brothers in 1781), gaol and work house facing on Centre Avenue, then known as King Street. North on Court Street to Washington Avenue Turn Right. Washington Avenue before the Revolution was known as YardleyviIIe-Ferry Road, going to the ferry crossing the Delaware at Yardley. Later known as Middle Street. Built in 1832. Parish building erected in 1893 and bell tower in 1904. Old Cemetery in the rear. Note Celtic Cross in the cemetery. New Parish Building erected 1964. Built in 1830 by Joseph O. Archambault, Dentist, Innkeeper and Postmaster, who owned the Brick Hotel. During the Civil War it was a station in the underground railroad for the escape of slaves from the South. Note beautiful iron grill work on porch. Congress Street was opened June 15th, 1784 by Margaret Thornton, proprietor of the Court Inn. Colonial brick house built in 1836 by Alexander Blaker For 45 years home of Mr. and Mrs. J. Stanley Lee. Mrs. Lee was a descendant of Mr. Edward Hicks, primitive painter. NEWTOWN LIBRARY – Southwest corner of Centre Ave. & Congress St.
BUCKMAN HOUSE — Northeast corner of Congress St. & Penn St. Built in 1830 for Ann Buckman’s select school for girls. STONEHURST – Northwest corner of Penn St. and Congress St. Built in 1833 by Isaac Worstall Hicks, son of Edward Hicks. Notice beautiful gardens and old Philadelphia gas lights. Built in 1821 by Edward Hicks. 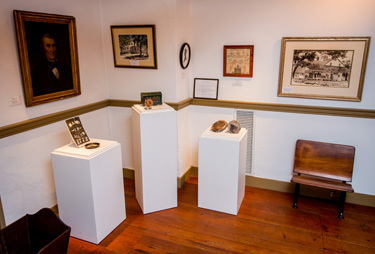 Hicks began his career as a wagon and sign painter, became a prominent Quaker and in later life turned to the painting of Bucks County farmscapes and pictures depicting stories from the Bible. He is considered to be one of the outstanding American primitive painters. Hicks lived in this house until his death in 1849.